Hello friends! 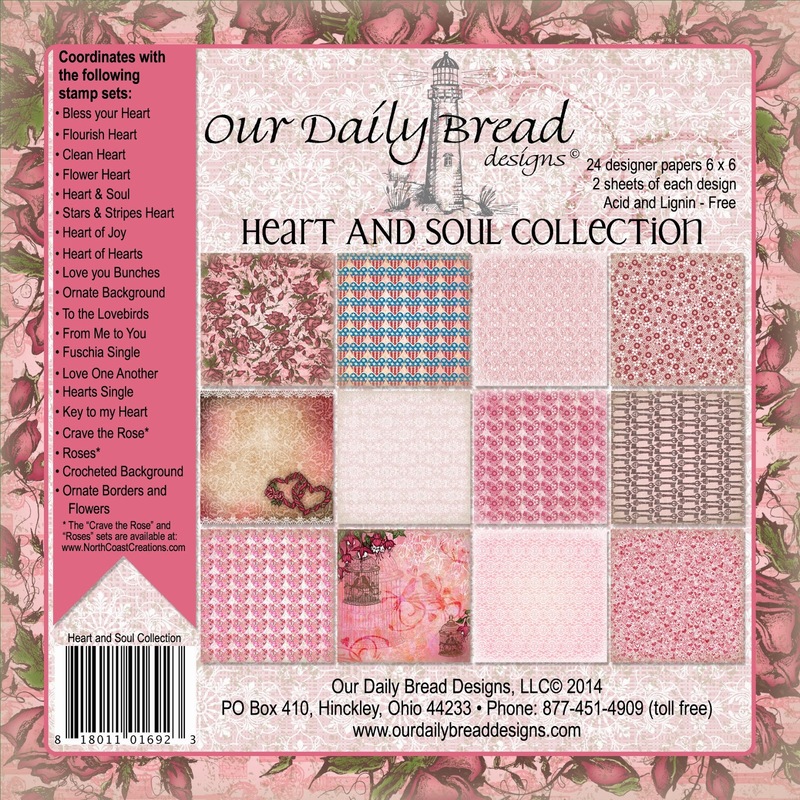 Today we are revisiting the fabulous Our Daily Bread Designs February Release. This release was just brimming with love and lots of gorgeous hearts. Here's a sample made with just a few of them! Creative Nugget: The front of the card was created by stitching and piercing together several new designer papers from the beautiful Heart & Soul Paper Collection. One of the Beautiful Border Dies was cut twice and layered with a strip of DP to make the scalloped border. 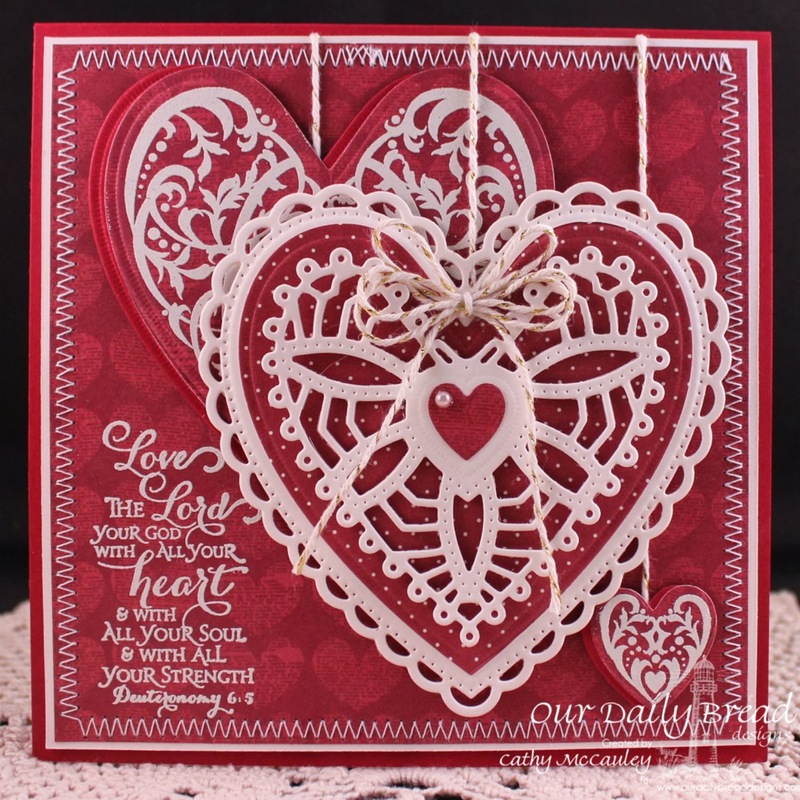 The shaker part of the card was created by stamping the Bless Your Heart on Select White card stock and cutting it with the scalloped Ornate Heart Die. A sentiment from the set was also stamped on this piece. The frame was cut using two of the Ornate Heart Dies nested together. The smallest of the heart dies was used to make the hearts inside the shaker, and little pearls were added to some of them. A piece of acetate was attached to the back of the scalloped frame. A double layer of mounting tape was used to attach the frame to the stamped heart with the little hearts inside. A bow and one of the little hearts finish the card. For more gorgeous inspiration using the February Release, be sure to visit the ODBD Blog. Then, for more details on each creation, visit the blogs of my talented DT Sisters! Thanks so much for stopping by. I hope you were inspired by your visit! Hello again, sweet friends! This release has been so much fun to design for…but the fun isn't over yet! Welcome back to DAY 5, and the final day of Sweet 'n Sassy Stamps February Release Feature Blog Hops! The teardrop image measures approximately 1.3" x 1.5"
Creative Nugget: Rose Bud, Teal Zeal, and Cantaloupe Memento inks were randomly sponged onto pieces of Select White card stock. The Delightfully Delicate Background was stamped using Versafine Onyx Black ink on one panel which was cut into three sections and mounted to a piece of True black card stock. Several chevron shapes were cut with the Shape Dies and stamped using the chevron image from the Shape Up stamp set. These were also mounted on the black panel. Finally, a sponged strip was added at the bottom of the black panel. Some seam binding was sponged with the same three colors and added along with a key charm I found in my stash of embellishments. The sentiment from the Inspirational Word Art 1 stamp set was stamped once on a Spellbinders Circle Nestie and once on one of the sponged scraps. Two words were cut from the sponged piece to highlight those words on the circle panel. This was then attached to a True Black Scalloped Circle Nestie and popped onto the card. 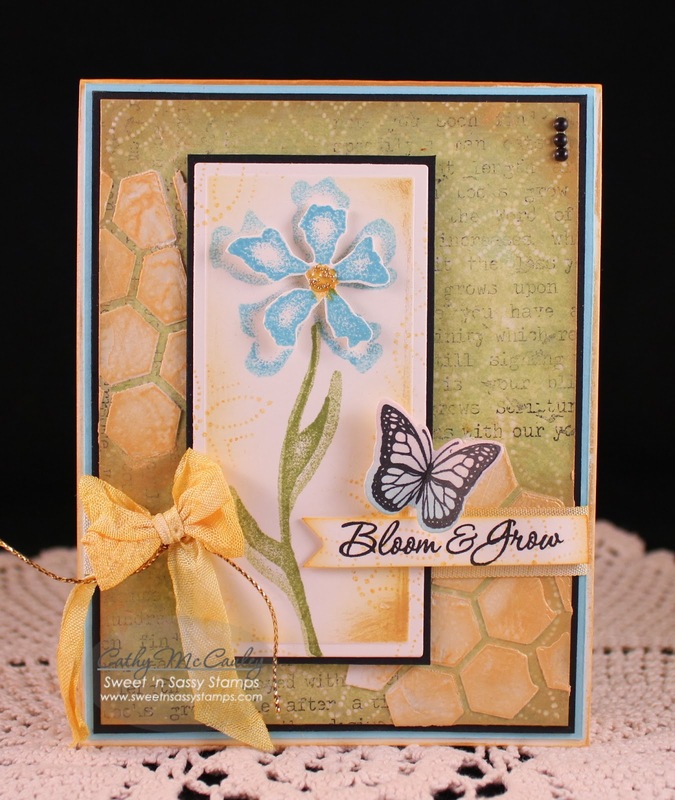 This sample demonstrates how wonderfully the stamps sets in this release work together! The DT has shared their gorgeous samples in the thumbnails below. 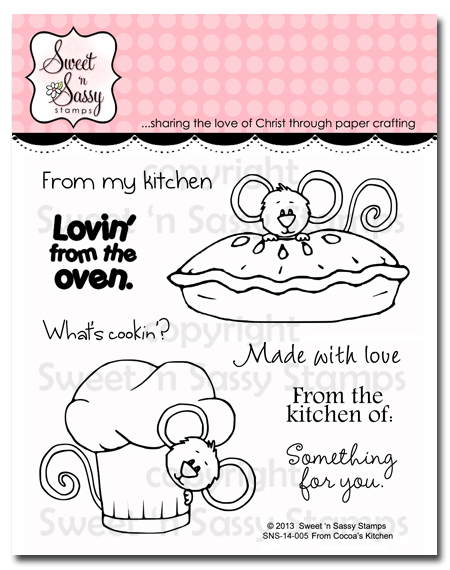 Stop by each of their blogs and comment for a chance to WIN one of (2) $20 gift codes to the Sweet 'n Sassy Stamps Store! Thanks so much for joining us! I hope you've been inspired by our February Release Blog Hops! Have a wonderful day! Hello friends! He's back…the delightful and adorable mouse, Cocoa, has snuck into the kitchen! 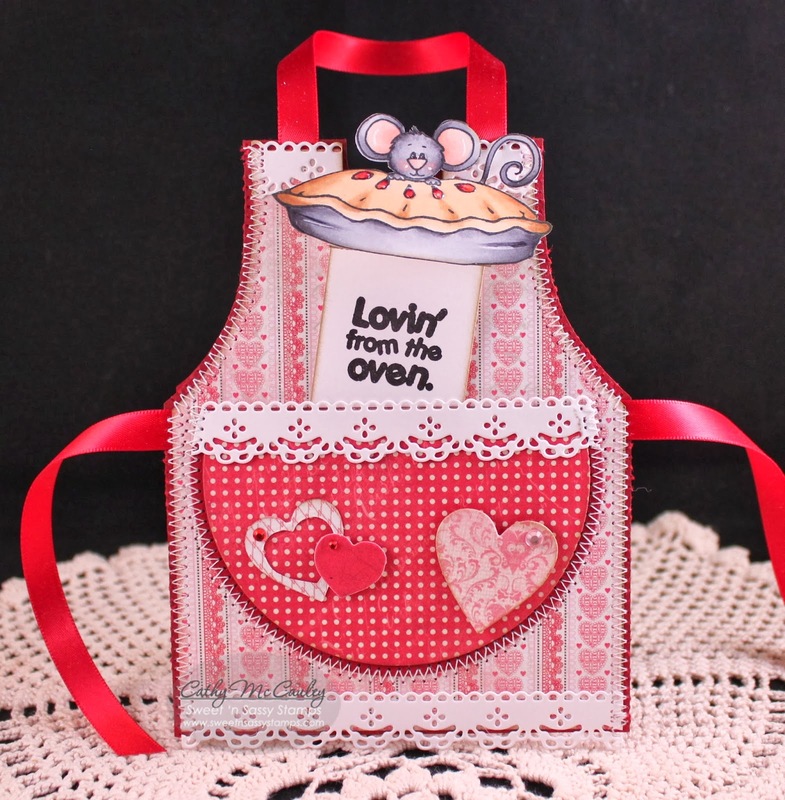 Welcome to DAY 4 of Sweet 'n Sassy Stamps February Feature Blog Hops! 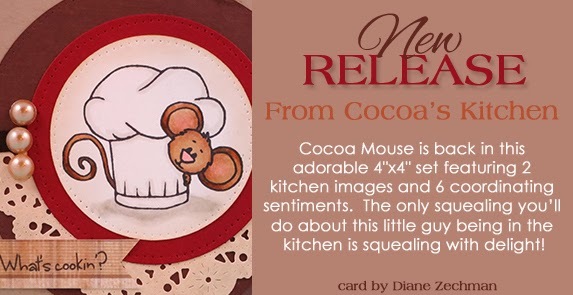 Today the DT is thrilled to share the new From Cocoa's Kitchen with you. This adorable 4"x4" stamp set features 2 kitchen images and 6 coordinating sentiments. I had tons of fun with this one! Creative Nugget: Everyone needs an apron while baking in the kitchen…right? I started by creating a template for Cocoa's apron and a liner by tracing Spellbinders Circle and Oval Nesties for the arms and neck openings onto scratch pieces of card stock. These were traced onto a Real Red card base and on a piece of Authentique designer paper. The pocket is a Spellbinders Circle Nestie with the top cut off. A Doily Border Die was trimmed to fit around the neck, the top of the pocket, and the bottom of the apron. A few Heart Dies decorate the pocket. Ribbon was added to create the apron ties before everything was stitched together. The Cocoa image was colored with Copic Markers and fussy cut. The Cocoa image was then attached to a tab which slips into the pocket so that Cocoa can peek out…keeping an eye on his kitchen! Thanks so much for joining us! Enjoy today's hop! Hello sweet friends! I hope you've been enjoying the February Release so far, and I'm glad you've returned for DAY 3 of Sweet 'n Sassy Stamps February Release Blog Hops! 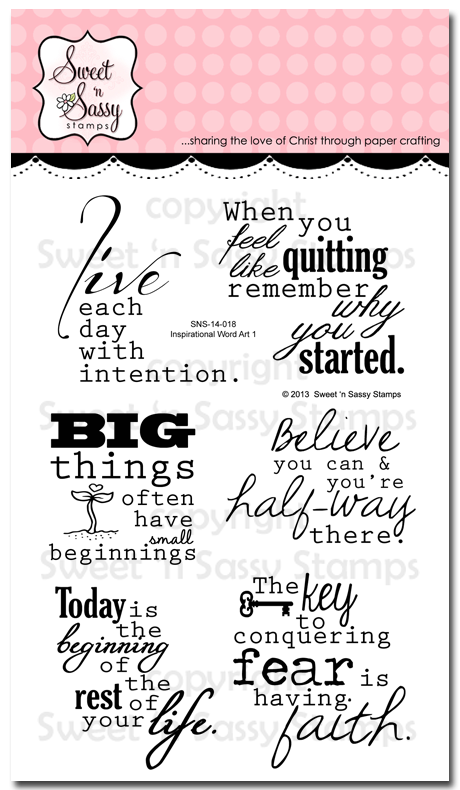 Today the DT is thrilled to share the new Inspirational Word Art 1 with you. 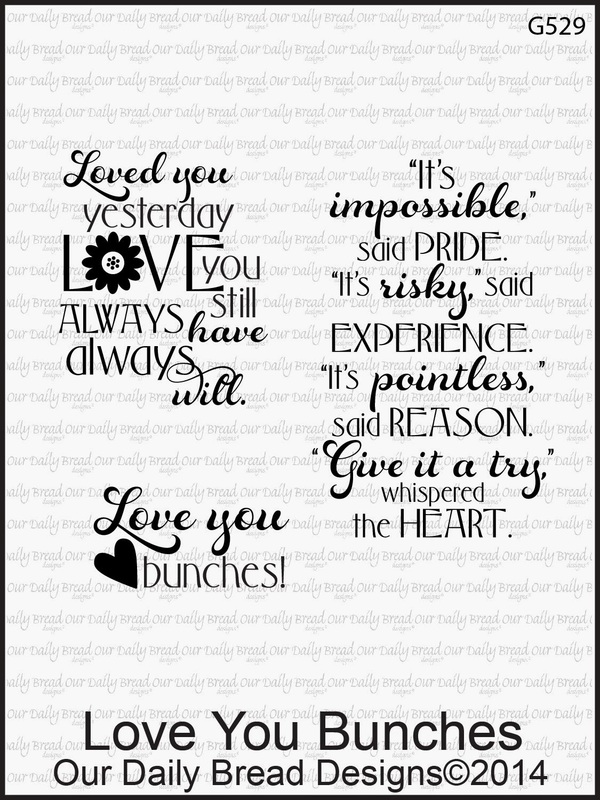 This 4"x6" set includes 6 inspiring sentiments that are sure to encourage any recipient and go nicely with any stamp sets you already own. This set is the first in it's series! Creative Nugget: The herringbone background was made by adhering strips of KaiserCraft designer paper from the Lavender Haze Paper Pad to a panel of Scor-Tape Adhesive. This was then adhered to a piece of True Black card stock and mounted to a Select White card base. The Inspirational Word Art 1 sentiment was stamped on a Decorative Plaque Die along with one of the Decorative Frame Toppers. This was popped up on another of the Decorative Plaque Dies cut from True Black card stock. Copic Markers were used to color the little flower image. A large Scallop Border Die, Ribbon, Baker's Twine, and a button finish the card. Creative Nugget: Since I have a hard time throwing away my paper scraps, some from my first sample were salvaged to make this second card. A Poppy CB folder was used to emboss a panel of Select White card stock to which the paper strips were woven and attached. This panel was stitched to some True Black card stock. The Inspirational Word Art 1 sentiment was stamped on a Spellbinders Circle Nestie, sponged, and popped up on a Spellbinders Scalloped Circle Nestie. One of the Majestic Monarchs were stamped right on the DP and cut with the matching Monarch Dies. A few pearls finish the card. 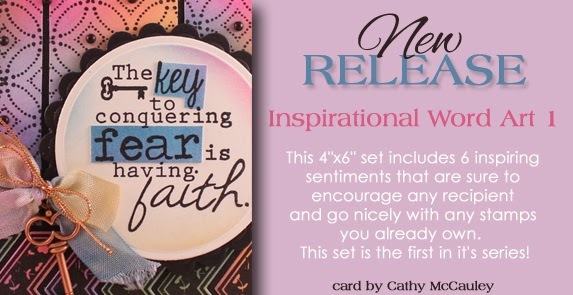 I had so much fun with this set that I can hardly wait for the next Inspirational Word Art stamp set! Hello everyone! 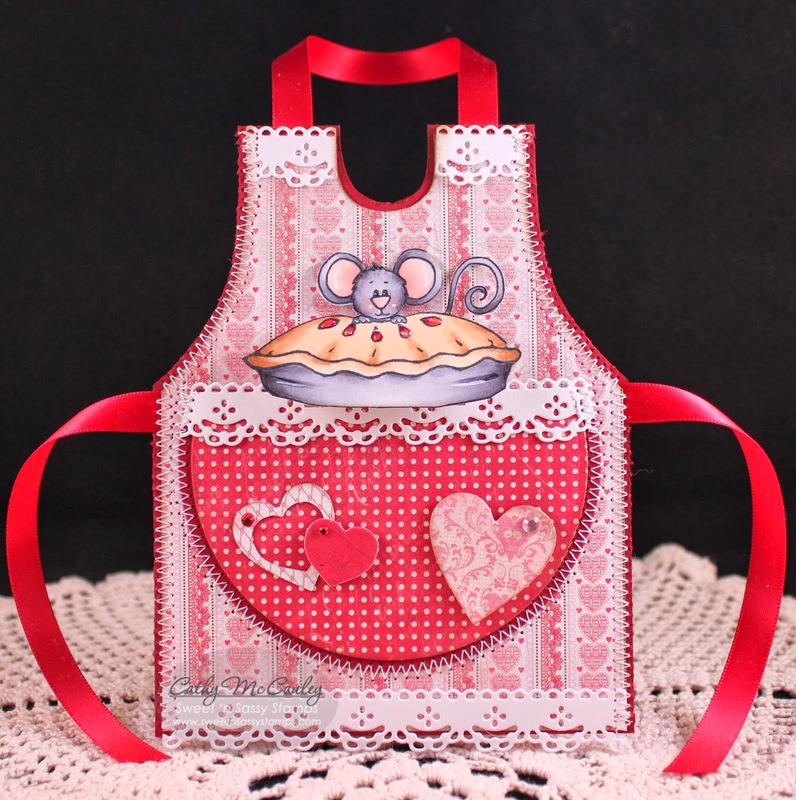 Welcome back to DAY 2 of Sweet 'n Sassy Stamps February Release Blog Hops! Today the DT is thrilled to share the new Delightfully Delicate Background with you. 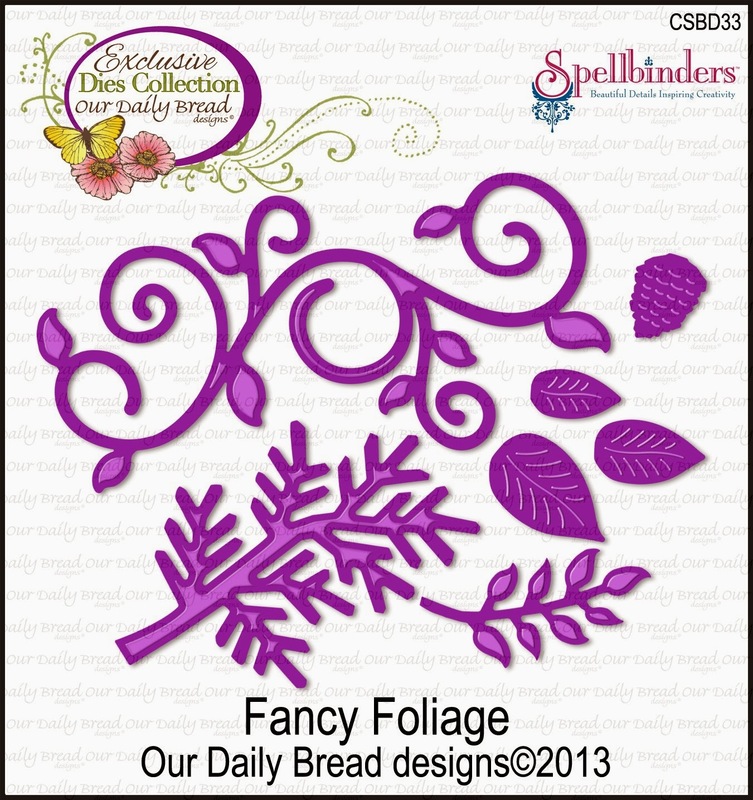 This gorgeous image is a seamless background stamp that can be used to make as large a background as you wish! You'll love the dainty touch it adds to your projects! Image measures approximately 3.75" x 3.75"
Creative Nugget: The background is very subtle on this card as I tried a new mixed media technique. It was clear embossed on mixed media paper and Peeled Paint, Spun Sugar, and Broken China Distress paints were applied over the whole panel. Some Typewriter Text was lightly stamped on portions of the panel after it had dried. Next, modeling paste was applied through a honeycomb stencil. As that was drying, the flower from the Bloom & Grow stamp set was stamped on another panel. The Delightfully Delicate Background was lightly stamped in Wild Honey ink around the edges of the flower. Inka Gold was sponged on the modeling paste and around the edges of each panel. A hand cut banner with one of the sentiments from the Bloom & Grow stamp set was added along with some ribbon, pearls, and a Majestic Monarch to finish the card. Hello friends! After being without power for three days, I'm thrilled to be able to be here for DAY 1 of Sweet 'n Sassy Stamps February Release Blog Hops! 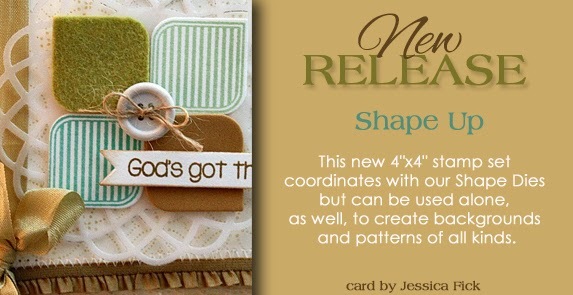 This 4"x6" set includes 6 images that can be used together for layering or to create backgrounds. 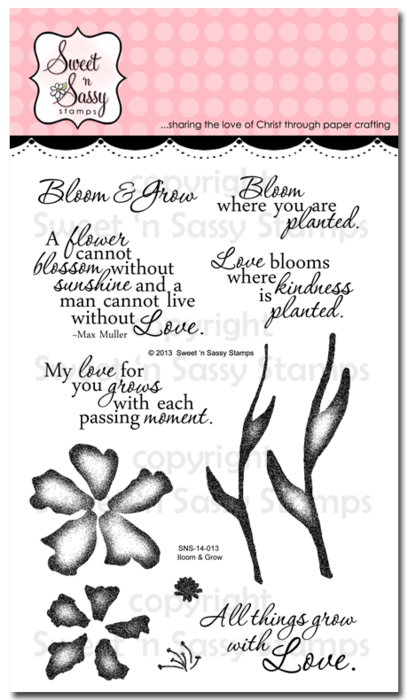 It also includes 6 beautiful sentiments that have to do with blooming and growing…a lovely new set to get you thinking about spring…and right now I wouldn't mind a little bit of Spring! 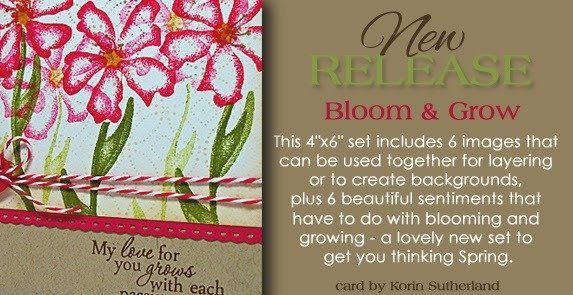 Here are a couple of cards using Bloom & Grow to spark your creativity! Creative Nugget: On this card the flower grows with each passing moment to match the sentiment. Gelatos were colored directly on the stamps and spritzed with water to create a watercolor effect. The larger flower image was stamped off once before stamping on the card for a lighter shadow behind the smaller image which was stamped full strength. The same technique was used for the stems. The sentiment banner was hand cut and popped onto the right side of the card, and Majestic Monarchs, cut with the Monarch Dies and colored with Gelatos, were added along with a few pearls to finish the card. Creative Nugget: On this card a square was masked in the middle of the panel along with a border. Light sponging with Summer Sky Memento ink was done between the masks. 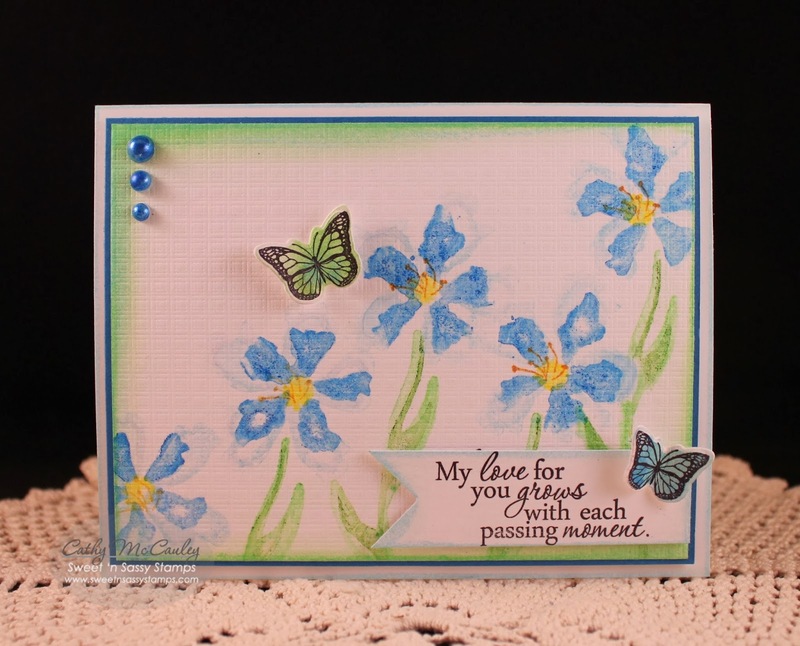 A combination of Memento inks and Stampin' Up! inks were used to stamp several images from the Bloom & Grow stamp set. The masks were removed and the sentiment was stamped in the middle. 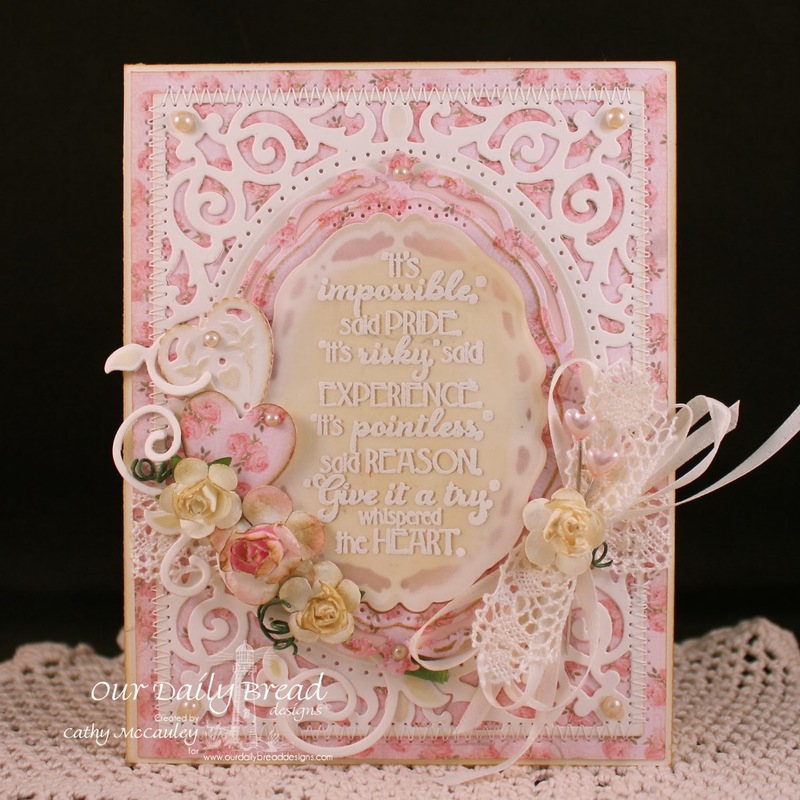 A Doily Border Die, a few pearls, and gingham ribbon were used to finish the card! Hello everyone! Since I'm hosting the sketch challenge on Splitcoaststampers today, I thought I'd post my sample for you here as well. 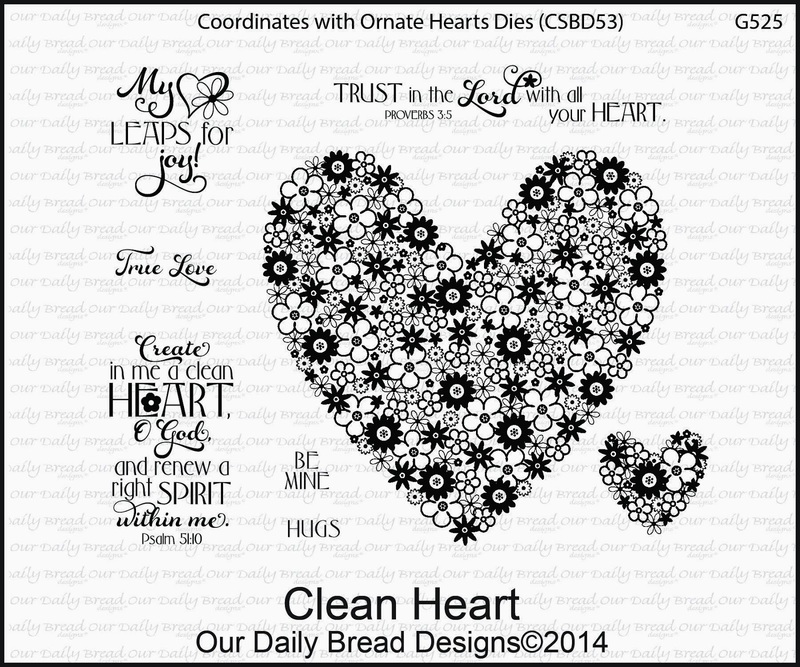 The heart on the sketch was perfect for the new heart stamps and dies just released by Our Daily Bread Designs! 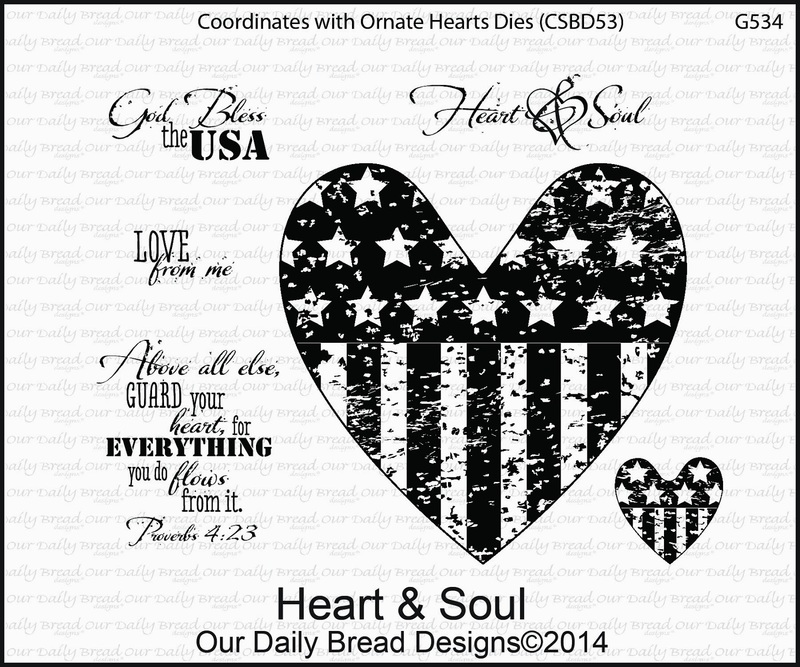 Since Heart & Soul was on my desk, that's the one I used for my card…love the patriotic theme! Creative Nugget: Two of the Beautiful Borders were attached to Select White card stock for the horizontal panels on the sketch. Stars were embossed on the Brocade Blue banner and swiped with a Fresh Snow stamp pad to make the stars pop a little. This panel was stitched to Brocade Blue card stock and mounted on a Select White card base. Brocade Blue and Real Red markers were used to color the Heart & Soul stamp to achieve the two tones. The heart was then cut with the matching Ornate Heart Die and popped up with mounting tape. The sentiment from the Heart & Soul stamp set was also colored with markers to get the two tones. Some jute colored with a marker and a veneer arrow were added to finish the card. 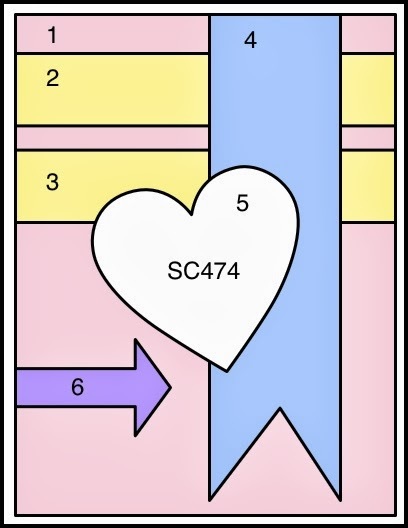 And here is the SC474 sketch for today on Splitcoaststampers…hope you can join in! Good morning friends! There are two GOOD things about lots of snow! First... it's gorgeous before pollutants have had a chance to contaminate it…so clean, pristine, and pure! What a perfect picture of a person who has been forgiven of their sins. Isaiah 1:18 says, "Though your sins are as scarlet, They will be as white as snow; Though they are red like crimson, They will be like wool." Aren't you thankful for God's mercy? The second GOOD thing about snow is that work sometimes gets cancelled, and that means more "Stamp Time." So, today I decided to play along with the Shining the Light Challenge over at the Our Daily Bread Designs Blog. The challenge this week is a recipe…include something on your card that begins with each letter in the word "L-O-V-E."
Thank you so much for stopping by today…stay warm! Hello friends! February brings us just a little bit closer to spring and warmer weather…and I'm ready for that…how about you? The beginning of February also brings us a new release from Our Daily Bread Designs, and WOW…what a release it is…romantic, vintage, and whimsical heart stamp sets along with gorgeous heart dies perfect for Valentine's Day, Wedding, and Anniversary cards and gifts! You will see gorgeous and diverse samples with this release as you visit the blogs of my super talented Sister Sticks! 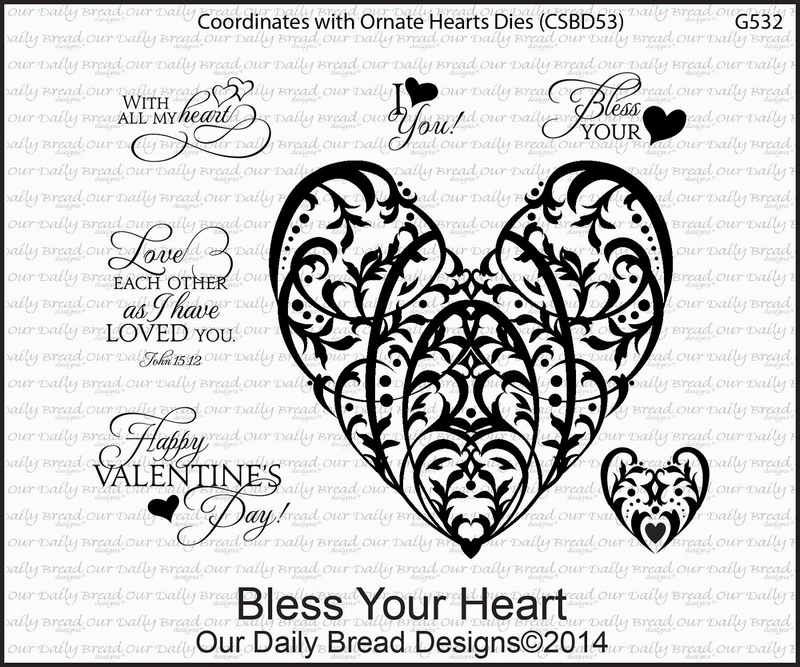 Three winners will be randomly chosen from the comments left on the designers' blogs to receive a $25 Gift Certificate to the ODBD Store to be used toward the purchase of ODBD stamps. You have until February 2, 2014 at 9:00 p.m. EST to make your comments! The winners will be posted on the ODBD Blog on February 3rd, so be sure to check there to see if you won! Creative Nugget: The Clean Heart was white embossed on Kraft card stock and some of the little flowers were colored in with Gelatos and rubbed in with a baby wipe for just a touch of color. This was mounted on the largest of the Ornate Heart Dies. One of the Beautiful Borders was added behind the heart and both were mounted on a piece of designer paper which was stitched to Cherry Cobbler card stock and a coordinating piece of designer paper on an angle. Another layer of Cherry Cobbler was added and the whole card front was mounted to a Soft Stone card base. 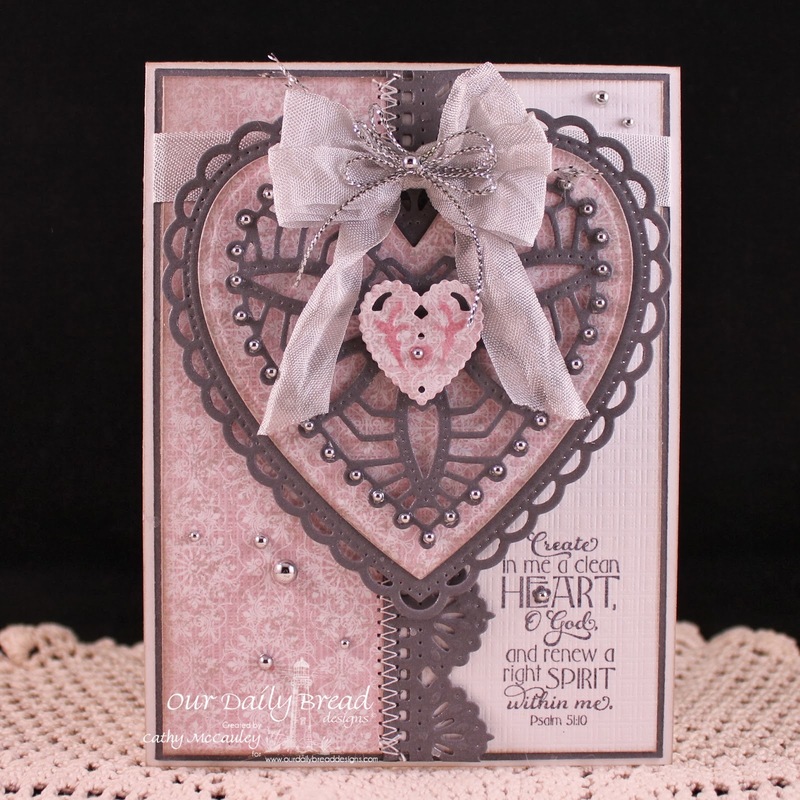 A double bow, a little Ornate Heart stamped with one of the sentiments from the Clean Heart stamp set, and a pearl finish the card. My second sample uses a different sentiment from the Clean Heart stamp set along with the Ornate Hearts Dies, the Beautiful Borders Dies, and some of the beautiful new Heart and Soul Paper Collection. 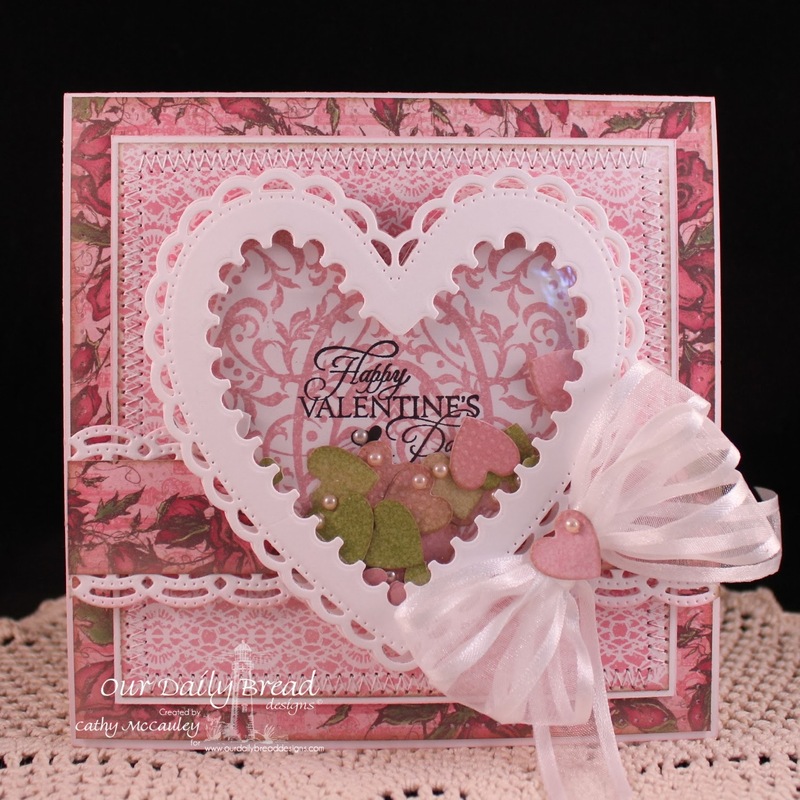 Creative Nugget: The Heart and Soul Designer Paper and the Ornate Hearts Dies are the main feature on this card as the only stamping is the sentiment. The papers and dies are layered onto Basic Gray card stock and a Solar Crest card front. A bow, silver cord, and silver pearls finish the card. In case you missed it, here is another card already posted on my blog…click HERE for the details. Thank you so much for joining me today…have a wonderful day!